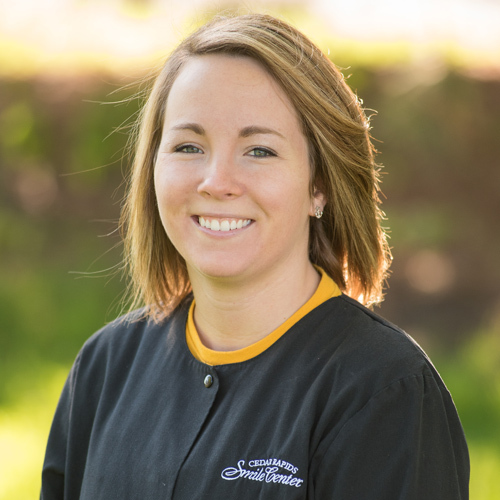 Jenny received her dental assisting training from Kirkwood Community College 2012 and joined the Cedar Rapids Smile Center in May 2015. She completed her Expanded Functions training in 2015. Jenny is a Marion native and currently lives in Cedar Rapids with her husband Tony and daughter Kate. She enjoys reading, walking, being outside, and spending time with her family. Erica is a Registered Dental Assistant, Expanded Function certified. 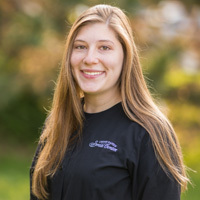 She's been in the dental field for over 10 years, with experience as an office manager, assistant and more recently providing lab technician skills. She enjoys spending time with her family, boating, reading, and having bonfires. 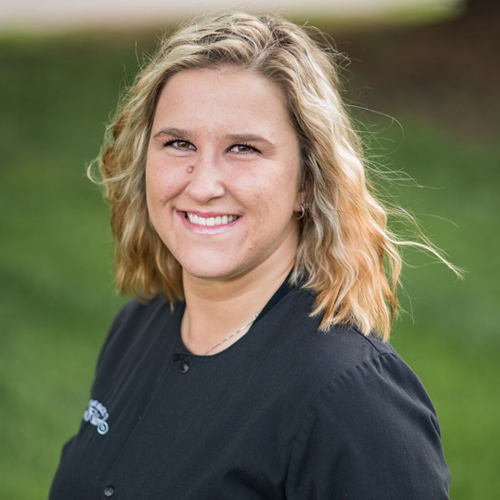 Lindsey graduated from the dental assisting program at Kirkwood Community College and has since earned her Expanded Functions and National Certifications. 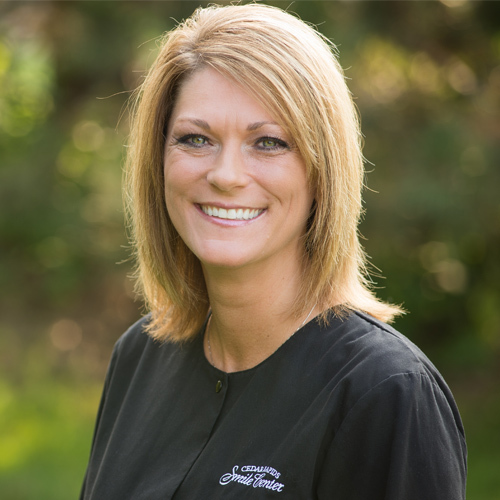 She has been with the Cedar Rapids Smile Center since 2009. Lindsey enjoys reading, watching movies, and spending time with friends and family. She has been married to her husband, Josh, since October 2018. Luba is originally from Latvia and moved to Iowa in 2004 with her mom. Russian is Luba's first language. She is a 2015 graduate from Kirkwood Community College Dental Assisting program and was Expanded Functions certified in June of 2016. 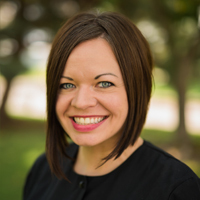 She has been with the Cedar Rapids Smile Center since December of 2015. She enjoys watching movies and TV shows, going to the gym, spending time with family, camping, and walking dogs. She has 3 fur babies: a Pug-mix named Apollo, a Dachshund named Rockee, and boxer named Mia. She lives with her boyfriend Dan, who is a welder. Sharon has been with Cedar Rapids Smile Center since June 2008. She received her dental assisting training from Northeast Iowa Community College at Peosta and has been in the dental field since 1998. She enjoys reading, scuba diving, traveling, and going to Iowa games. She has two standard poodles, Mic & Finn. Makayla graduated from Kirkwood Community College from the Dental Assisting program and has completed her Applied Science degree in 2018. 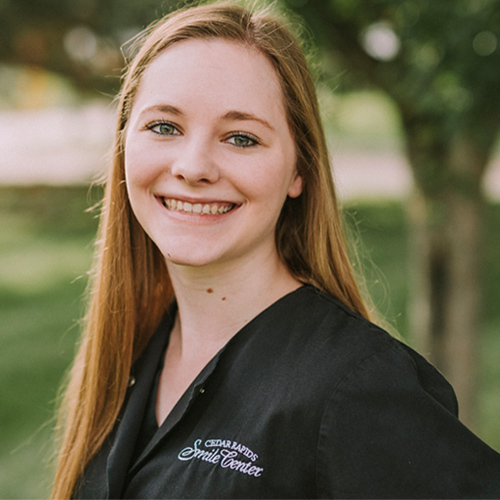 She has been with the Cedar Rapids Smile Center since her internship in November 2017 and was employed in January of 2018. She enjoys playing piano and hanging out at home. She has one sister and a twin brother.